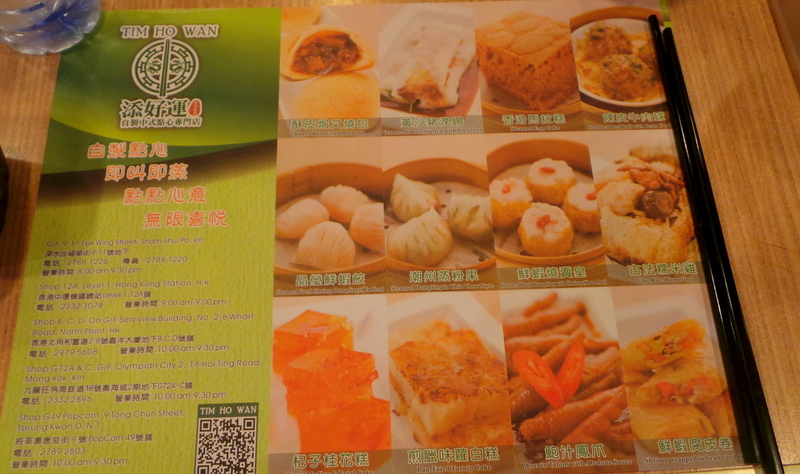 One of the things I got really excited about going to Hong Kong was Tim Ho Wan. 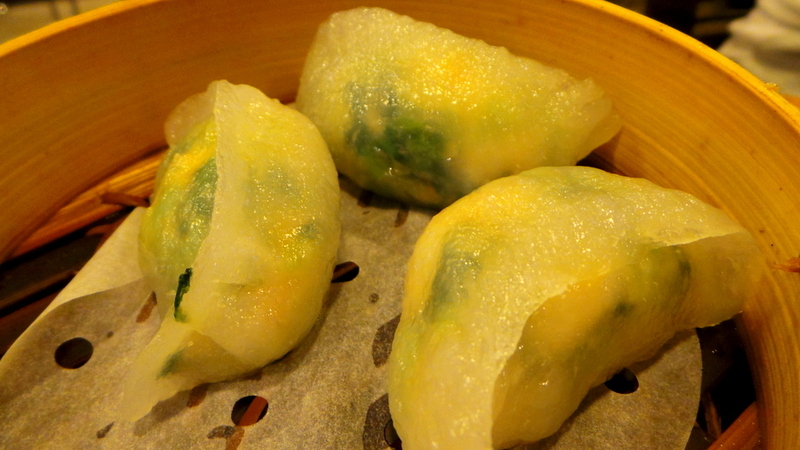 I love dim sum, and the best dim sums I’ve ever had were all in Hong Kong (regular ones like from Maxim’s). 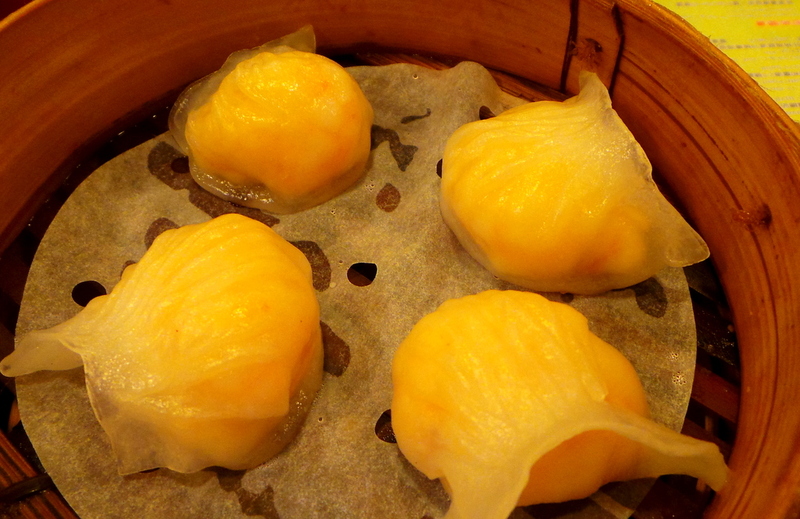 So when I heard that a dim sum restaurant in Hong Kong had been awarded a Michelin star, making it the world’s most affordable restaurant in that category, I was determined to try it. There are several Tim Ho Wan locations throughout Hong Kong. We only had abit of free time to try Tim Ho Wan towards the latter part of the trip, when we were staying at Hong Kong side, (The Conrad Hong Kong) with Admiralty station nearby. The nearest Tim Ho Wan from Admiralty is two MTR stops away at the IFC (International Finance Centre) at Hong Kong Station. It was initially hard to find this as it was on the basement (but the address said 1F) level of IFC, on the train station. And one must be careful in choosing which escalator to take from the main level. The first one we took led us to the actual train platforms. 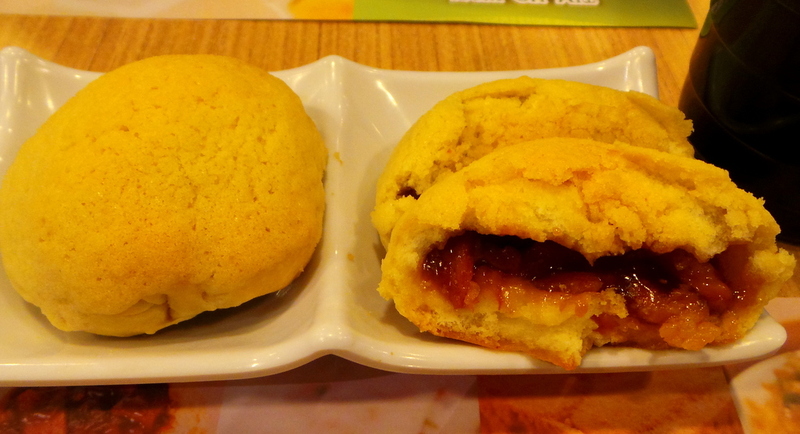 Our first go at Tim Ho Wan was a late dinner, with just an hour to go before closing. And even then, there were lines outside the restaurant. We waited about 30 minutes before getting a table. And yes, it was one of those waits where you are salivating over other people’s meals. Thankfully, it was one of those restaurants where you write/tick your orders on a sheet of paper. 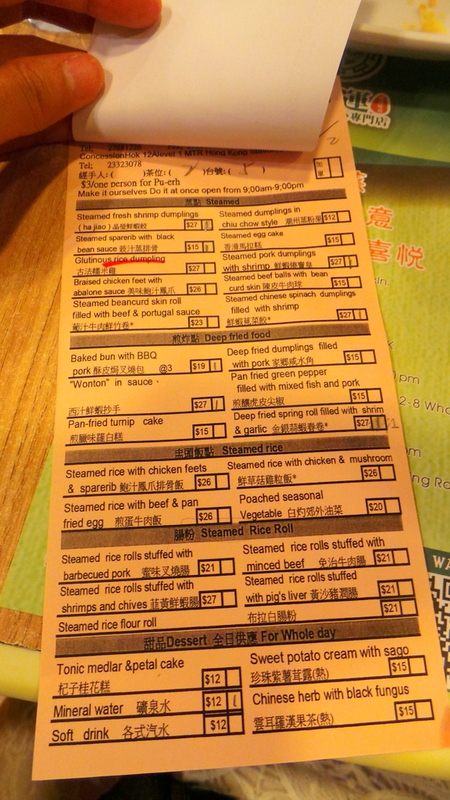 So we busied ourselves studying the menu and looking at what others were having, then ticking off our sheet. As soon as we had a table free, our orders came very quickly. Tim Ho Wan is like dim sum fast food, so we were almost sharing (tables and chairs just centimetres away) with a family of 3. I didn’t mind as I was really hungry and just couldn’t wait to start. The dumplings were quite good. The wrappers weren’t too starchy which is a good thing. We really ordered much more than this but only realised we haven’t taken a single photo when we were halfway done. Because soon as the bamboo steamers came, we gobbled them up very quickly. These. My goodness. It was when I bit into these that got me nodding and whimpering in agreement that this place is worth the wait and the Michelin star. It’s Baked Barbeque Pork Buns. I’m sure most of you would have seen the “normal” kind, the steamed pork buns. They are good, but the white bun can be too overwhelming. The baked variety is a genius. Not only is the bread to meat ratio more decent, but the baked method gives the buns/bread a crusty and crunchy texture , it’s like biting into a crisp pie. Some people find the filling too sweet, but I like it. It’s like a cross between a savoury and a sweet meal. 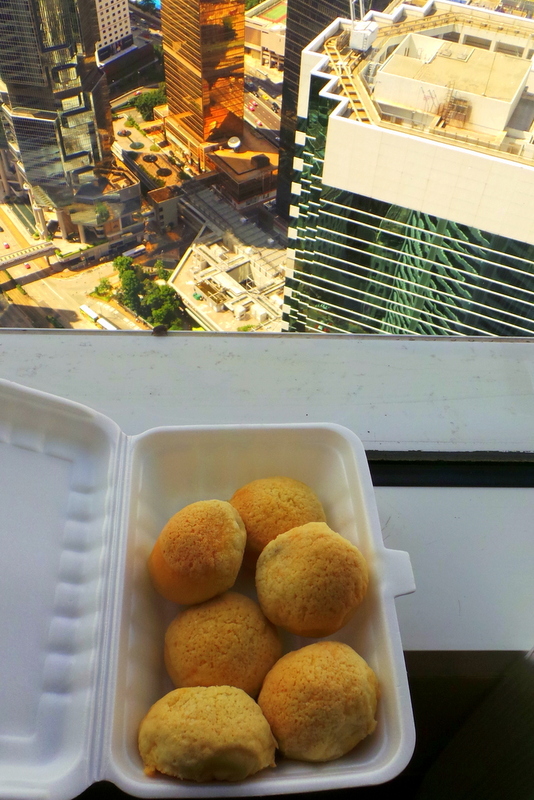 And it was these baked buns that made us trek all the way to IFC again on our last day in Hong Kong. It was a weekday, peak lunch hour time. I don’t know what I was thinking but after shopping separately, Zombie and I agreed to meet at the escalators leading to Tim Ho Wan at 12:30 PM. 12:30- peak hour lunch time! The crowd was unbelievable, you’d think that there was some commotion or that George Clooney was having lunch there. As my hunger level rose, the cloud of black, dark mood crept up on me. Suddenly everyone was annoying. EVERYONE. Zombie, for being so calm and listening to music with his headphones on. Seriously! Why is he not reacting? There is a crisis here! The lovey-dovey couple next to me who kept giggling and necking. Get out of the line and get a room! The cashier for calling out the numbers in cantonese, wishing it was in english so I could at least know how much longer I needed to wait! At Tim ( I assume the founder of Tim Ho Wan) for being ridiculous- why have such a small area the size of a living room when your business is thriving? YES. I’m ashamed to say, not only did I become HANGRY (Hungry + Angry), I also became a big time A**Hole. And minutes more, after the hangry spell went away, did I hear the cantonese word for number 29 (I had earlier asked Zombie what it was and memorised the phrase in my head over and over). As my hangry and hunger spell had already gone past the “I must eat now” phase, I decided that we should at least enjoy the buns in the comforts of the hotel. And soon as I sunk my teeth into those crispy yet soft buns, everything was all right in the world again. I know I must keep small nibblies with me to prevent my hulk-hunger episodes. But tell me, do you also become a hangry person at times? I have a serious love for those bbq pork buns! And hehe his name isn’t Tim (although that’s what I assumed too) but it’s Mak Kwai Pui. He’s a lovely, humble guy. I was lucky enough to sit down and have lunch with him and interview him at the Sham Shui Po location. Yep, sure do get Hangry…… it’s a terrible handicap but seems little in life upsets me except waiting in line for a restaurant that serves amazing food but somehow enjoys teasing people with such a small dining room. Glad it was worth the wait though, high fives to you for hanging in there. We had our nice long wait at the original MongKok location. When we did finally get in, we just kept ordering and ordering. We were flying back to Taiwan later that day though, so we took a few orders of the pork buns to go…though they never made it past the airport terminal. Hi Brett, wow I should have thought of that! But like you, I would probably eat those buns before boarding. They’re really one of a kind aren’t they. I wonder where I can find that in Sydney! Oh that’s awesome I’d love to see you two at WTM!! Oh I iwsh they’d open a branch here in Sydney, those buns look mavellous. I hate being hungry and get all shaky if it goes to far and then I do get FURIOUS too… try not to let it happen… and my kids are even worse… just been packing snacks as we head to Cairns tomorrow, myself and the four of them, wish me luck. mmm yummy yummy ! I was not adept of chinese food when I started to be a worldwide traveler, but now I am completely fan of it ! That’s good to know Francois! 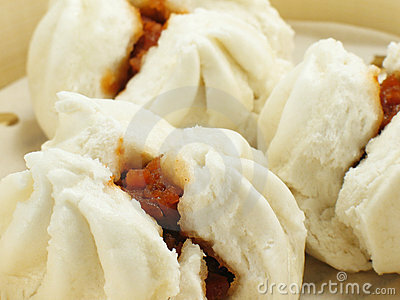 I’m still craving for those bbq pork buns. What is your favourite Chinese food so far? YUM! Those BBQ pork buns are way to sweet but I love the dumplings.